This is Norm’s World. He calls it that. It’s a world apart- somewhere north of a Boone County high plateau, down an unmarked pocked dirt road. Nailed to his weathered entryway is a sign that says something like “Smokers will be shot on sight.” When the door opens, the azure blue of a finger of the Shoals Lake is glimpsed behind the man who immediately seems to consume all the space, his and yours, not physically but in some other way. He is a “presence”. He lives surrounded by memories as well as hopes. Inside, a large great room projects what a man can do with a house when he unleashes his creativity. It’s somewhere between Marlon Brando and Andy Warhol, somewhere between the 1950’s and the 1950’s, with touches of today winking between winter weary potted planted. There are pictures of him in gleaming rods, pictures of him with Burt Reynolds, soft black and white prints of him out of the pages of Victor Hugo. You saw Norm in Darby’s Rangers and Hooper and in a bunch of flicks with Frankie Avalon and that crowd that cavorted all over the Southern California beaches. You saw him in Son of Flubber and The Misadventures of Merlin Jones, Monkey’s Uncle, The Happiest Millionaire and Black Beard’s Ghost for Disney and in The Towering Inferno. You probably saw him too, in Life Magazine and you might have seen him in Hotrod Magazine and Street Rodder. And you would have seen him in 77 Sunset strip had he been the star with the car rather than Ed “Kookie” Byrnes. By far this is the most famous T-bucket. One night in 1957 Norm and Franco Castanza where cruising up and down the local strip. Life magazine was also out cruising and looking for kids and cars just like Norm and his T. The Life magazine article on hot rods exposed the world to Norm and his ride. Two years earlier, Hotrod Magazine had done a feature article on Norm and his “Lightening Bug” feather light with a feel for the road. This car soon became known as the Kookie car. By September 1959 Kookie was on the cover of every car magazine and on the T.V. once a week. 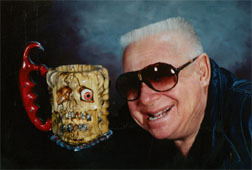 The television show “77 Sunset Strip” staring actor Edd Bryne who played the character Kookie began spreading the word. Hey! Y’all need to contact those movie sites (IMDb) and tell them that this talented man was in the movie Darby’s Rangers and had a speaking part, too. He is not listed in the cast members.